What led you to write WEEKENDS WITH DAISY? During the twelve months I worked with Daisy, I was continually impressed by all of the people who had a part in turning this little puppy into a service dog. I wanted to write about them: the trainers at NEADS, the prison inmate, Capt. Lefebvre, who oversaw the puppy program at the prison. Over time, the focus of the book turned toward my own transformation during that year I spent with Daisy. What were the best and toughest parts of your experience as Daisy’s weekend puppy raiser? The best and toughest parts are one and the same. It tore me apart to let Daisy go, but seeing her fulfill her destiny to become a full-fledged service dog made it all worth it. What’s the hardest thing to teach a dog? To ignore her instincts. As a puppy, Daisy loved to sniff. She’d keep her nose pressed to the ground during walks and everything else would become so much background noise. Fortunately, she learned to distinguish between being on and off the job and would suppress her sniffing instincts while she was on duty. That’s a very hard thing for a dog to do. For tens of thousands of years, dogs have been human companions, co-workers, and even “chick magnets”! What do you think dogs bring to our lives? Dogs bring pure magic to our lives. They’re like the genie in the bottle. Whatever it is we need at the moment, they somehow, magically give to us. I can’t explain how or why they’re able to do that. They’re just magic. Through Daisy, I learned that good and bad can co-exist in humans and animals and that it’s wrong to reject someone because they’re flawed. And another thing that I knew before Daisy but bears repeating here, unless you’re a dog, you shouldn’t expect to be loved unconditionally by anyone other than your mom and dad (and your grandparents). What’s your biggest pet peeve about other dog owners/handlers? I don’t have any pet peeves about other dog owners or handlers. I do have a problem with people who see a service dog in a public place and whistle or call out to the dog to get its attention. Worse, is when a complete stranger comes over and riles the dog up. I guess they don’t understand that the dog is working and needs to stay focused on its person. Where’s Daisy today? And do you currently have a dog? 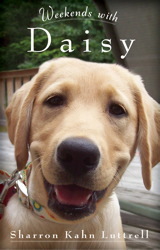 Daisy is living with a boy with Asperger’s syndrome and making life a little bit easier for him. I still don’t have my own dog, but I’ve been puppy raising pretty much straight through since Daisy. Right now, I’m preparing for my last weekend with Rescue, my fourth service dog-in-training. We’ve been together for a year, and while saying goodbye gets a little bit easier with each dog, it’s still the worst – and the best – part of being a weekend puppy raiser. Thanks so much, Sharron! Readers, WEEKENDS WITH DAISY is available now, either at the links below, or in your local bookstore. SHARRON KAHN LUTTRELL is a freelance writer and journalist whose work has appeared in various Massachusetts-based publications, including the Boston Globe. She continues to volunteer for NEADS as a weekend puppy raiser. How can anyone resist this face? And inside is a heartwarming, honest story about love, forgiveness, and letting go of the past. And the movie of DAISY is already in the works! Oh my god, Daisy is just toooooo cute.